Class III Milk and milk component prices were announced April 28. They were generally lower as expected and predicted in the last post to this blog. The high cheese inventories brought cheese prices back down to reality while the low butter inventories held butter prices near the $2.00/lb price. 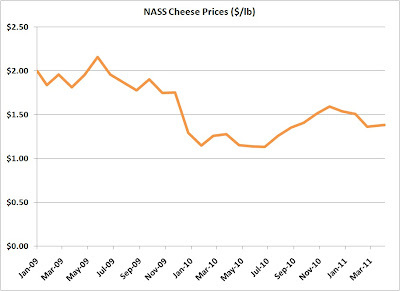 As discussed in previous posts to this blog, the Class III milk price is largely determined by the cheese price, Due to this, the Class III milk price took a significant fall from $19.40 in March to $16.87 in April. 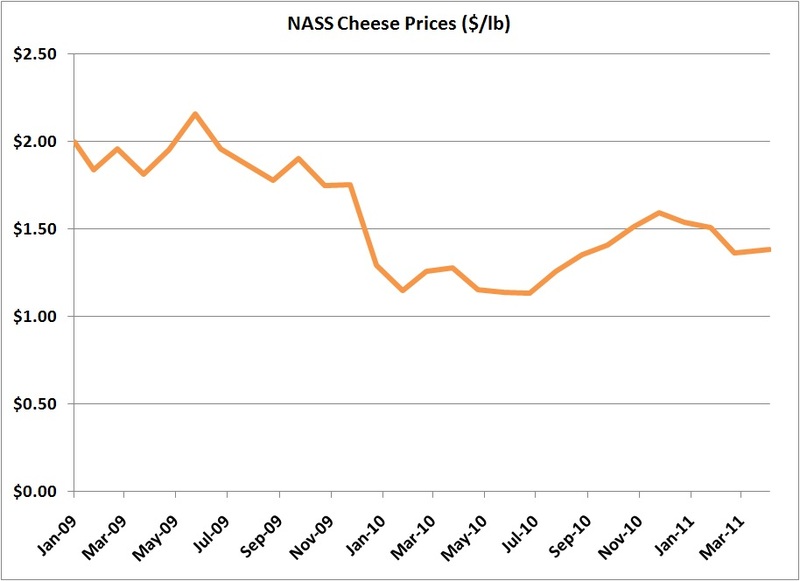 There is some very good news in the underlying fundamentals for the future price of cheese and therefore Class III milk prices. The good news will be discussed at the end of this post following an analysis of the April prices. 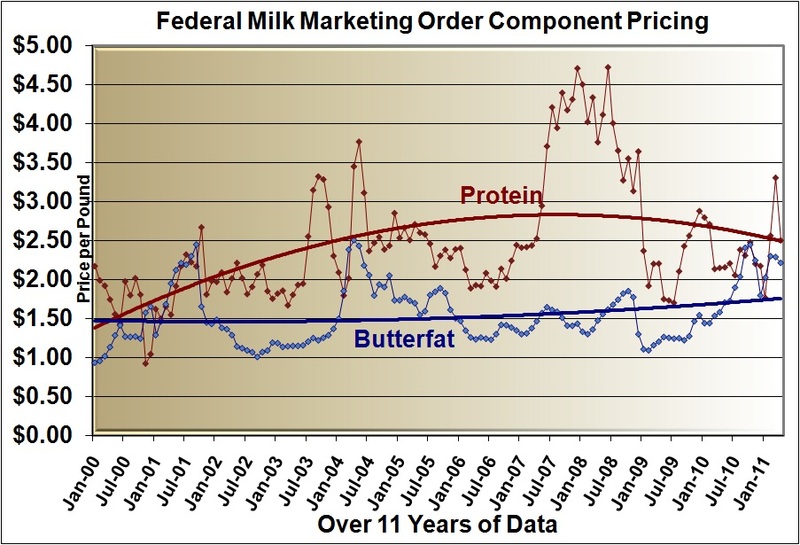 Below is the chart showing the evolution of milk protein and butterfat prices since the current pricing system was implemented at the beginning of 2000. The volatility is obvious. 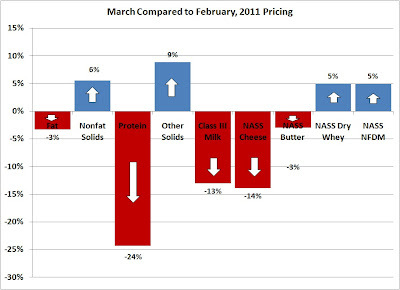 In April, protein fell significantly, in line with the drop in cheese prices. 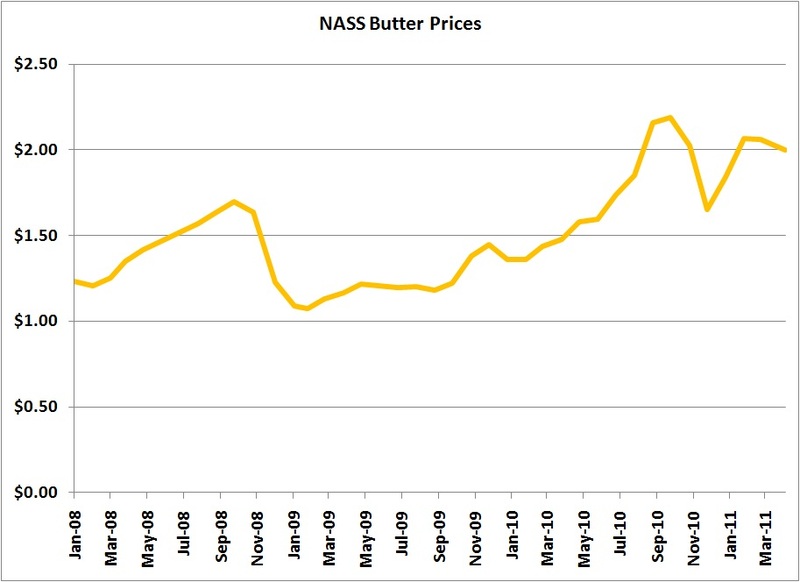 While butter prices can influence the price of protein; the April butter prices did not change much from March, so the drop in the price of protein was primarily based on the drop in cheese prices. Milk Protein dropped 24% from $3.30/lb to $2.50. 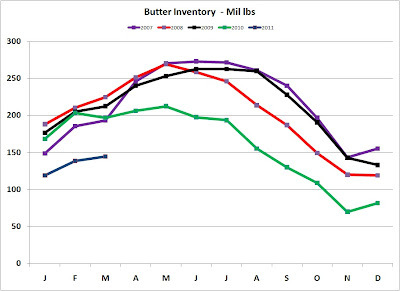 Butter inventories remain very low. 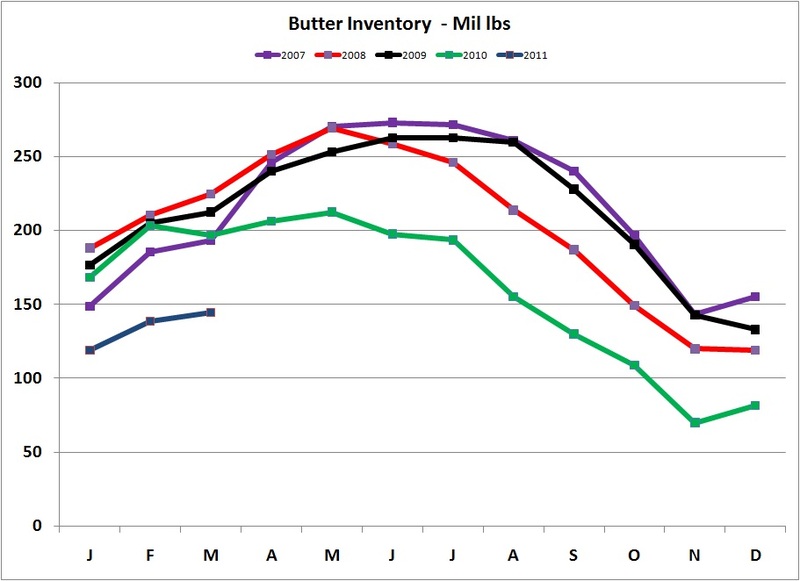 Butter inventories started getting tight one year ago and have continued low since then. There does not appear to be any return trend to normal levels. 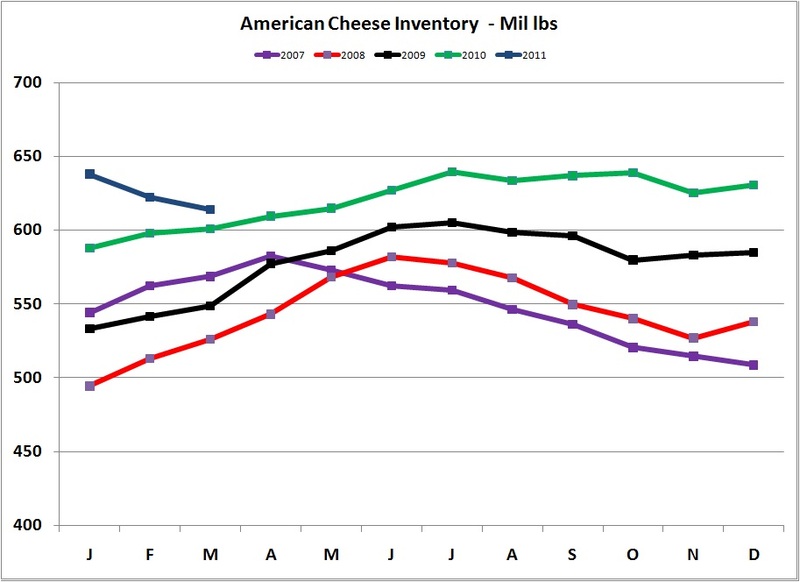 Low inventory levels will continue for many months and probably through all of 2011. 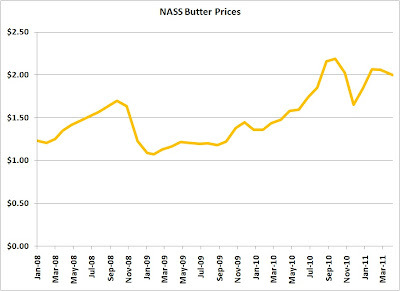 Because of the low inventory levels, butter prices have remained high. There is no reason to expect any change from the near $2.00/lb pricing for some time. When butter is at $2.00. 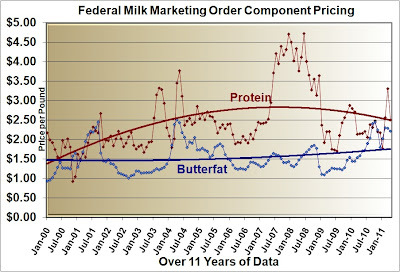 butterfat is priced at $2.21/lb. 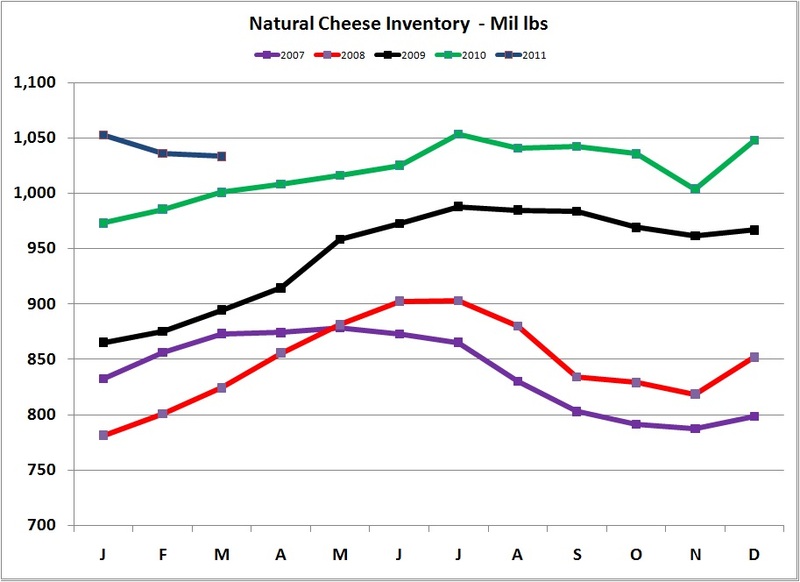 After a year of high cheese inventories, those inventories are falling. 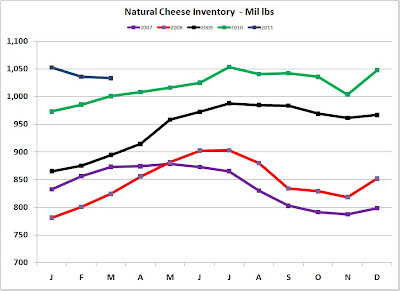 Both natural cheese inventories and American cheese inventories fell in February. Typically, inventories rise in February, so the decline in inventories is very significant. 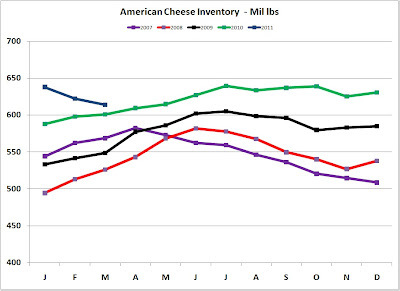 This is reflected in both the natural and American cheese inventory charts shown below. The drop in inventories has not resulted in higher prices, but certainly will if declines continue. 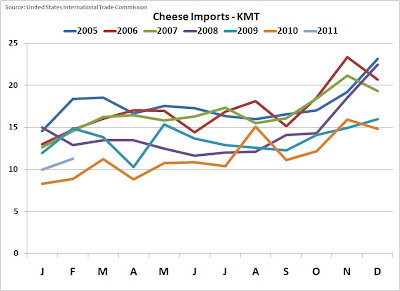 The decrease in inventories is clearly the result of increased exports and reduced imports. 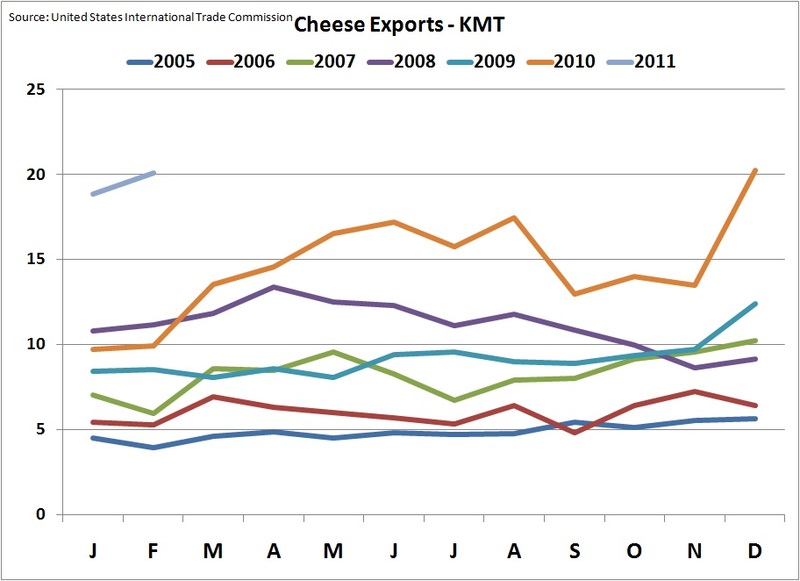 Strong export activity started in late December, 2010 and has gained momentum in January and February, 2011. Compared to one year ago, the level of exports has nearly doubled. There are many good reasons for this and as a consequence of these reasons, strong exports can be expected to continue and expand. 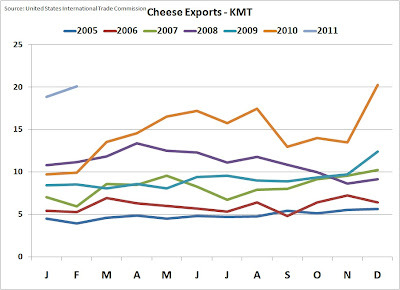 There is increased export assistance underway and the weak USD places U.S. cheese on the world market at very competitive prices. 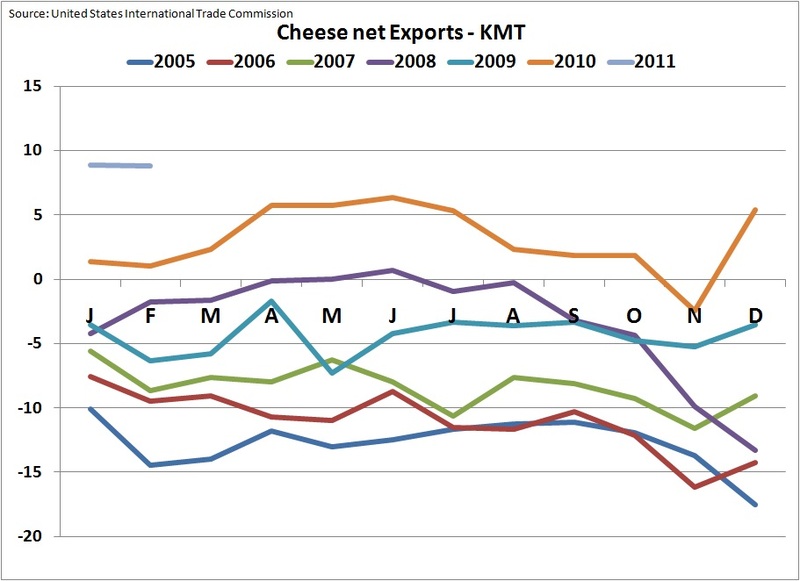 Cheese imports have dropped to near record lows as U.S. cheese pricing makes imports of commodity cheeses unattractive. 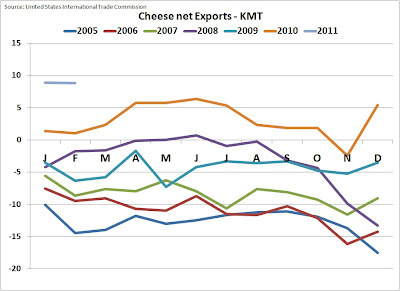 When combining the increase in cheese exports with the reduction in imports, the magnitude of the change becomes very apparent. 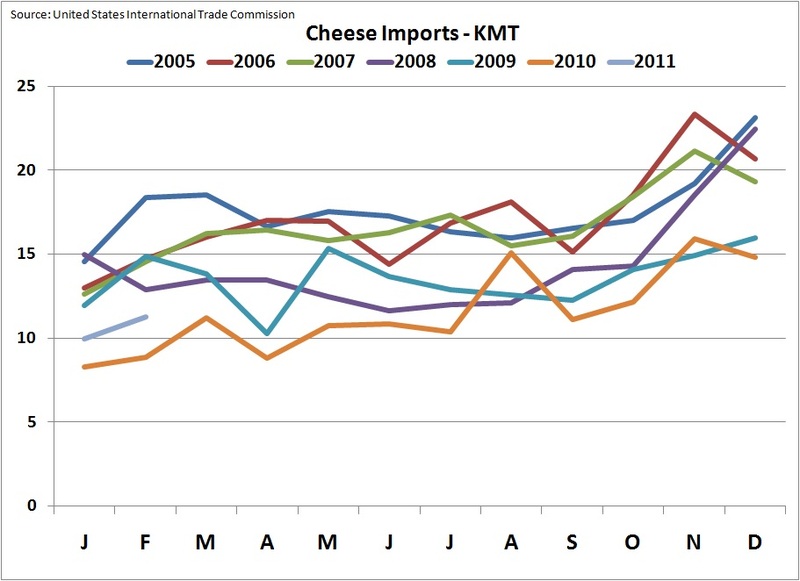 Certainly, there is a very significant change occurring in the demand for U.S. produced cheeses. April milk and component prices were disappointing and when combined with the high cost of feed, cash flow for producers is very tight. However, for those able to weather the financial storm, there are some very strong leading indicators that signal a significantly improved outlook for dairy prices in the upcoming months.